For most people a new season arrives with the changing of leaves and the rise and fall in temperature is an indication of the beginning of a new season. In the fashion world, a new season arrives with the opening night of a new fashion week, that brings with it new trends for the upcoming season. Like every season, Lakmé Fashion Week Winter/Festive 2015 was also abundant in trends. However, this season had quite a few micro trends that were as strong as the main trends, making it really difficult to pick favourites. After careful deliberation these are some of the trends that I think are a must try from the upcoming winter festive season. Attention, animal lovers! This trend may just be the perfect one to show off your love for your furry and feathery friends. 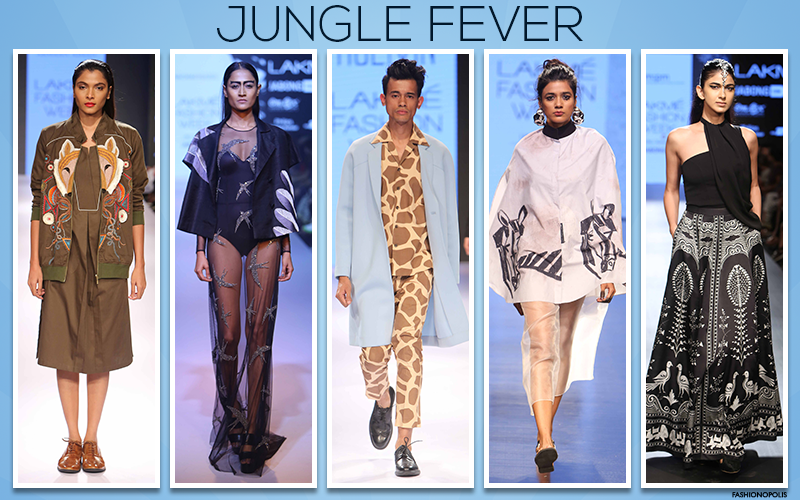 For Lakmé Fashion Week Winter/Festive 2015, designers found inspiration in the jungle. From in-your-face giraffe print motif to bold horse prints to sophisticated fox to delicate swirling swallows, the jungle resident have taken over the ramp! Step aside Batman there is a new cape crusader in town! No longer just for superheroes, the cape is officially the IT fashion trend of the season. 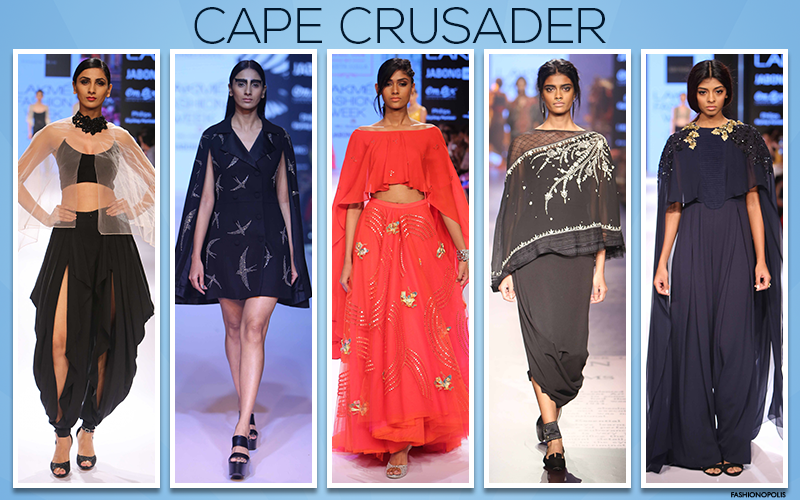 From long and dramatic to short and structured, every designer was set on showing some version of the cape at Lakmé Fashion Week Winter/Festive 2015. This season of Lakmé Fashion Week saw prints of all shapes, sizes, design and colours. From floral to fruity and from animal to artsy, prints of all kinds made an appearances. While some designer deiced to match it the others clashed it. 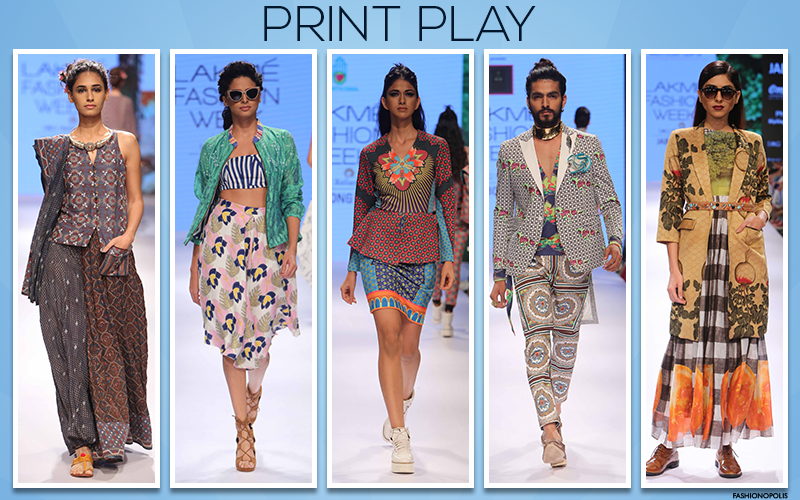 No matter what their styling preference and technique was, prints ruled at Lakmé Fashion Week Winter/Festive 2015. If there is one trend you would least expect to see during the festive winter season, it is this one. 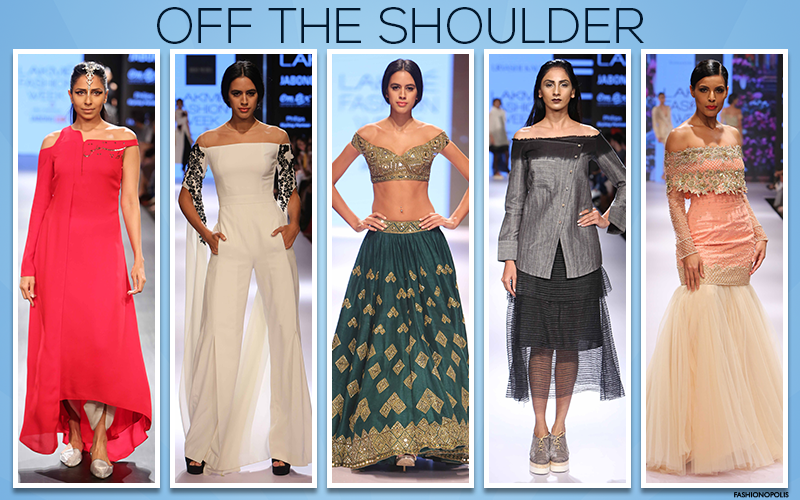 Quintessentially a summer trend, off shoulder is now making its presence felt during the festive winter season too. From Aprita Mehta’s mirrored choli to Urvashi Kaur's asymmetrical jacket, baring the shoulders was quite a popular style with the designers. Let’s face it- festive winter season and metallics go hand in hand. 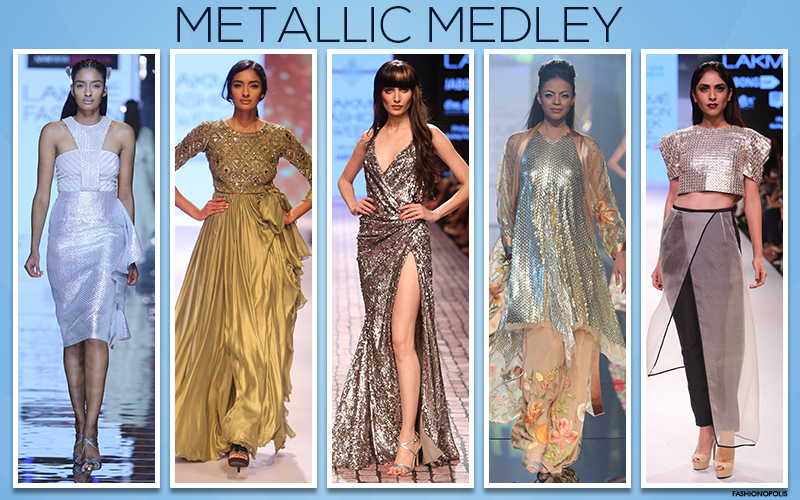 This season too saw an wide variety of metallic in different styles, materials, textures and surface ornamentation. From Monisha Jaising’s old Hollywood glam gowns to Namrata Joshipura futuristic Holographic fabrics, Lakmé Fashion Week Winter/Festive 2015 was a glittery affair.